IN STOCK: This model may be available for accelerated delivery. Find out more. Metal Shark’s 45 Defiant has been designed with military, law enforcement, pilot, port security, and fire rescue response missions in mind. The 45 Defiant is shown here in Military Patrol configuration, outfitted with patrol and search-and-rescue (SAR) options including law enforcement lighting, siren/loudhailer, gun mounts, tow post and towline reel. 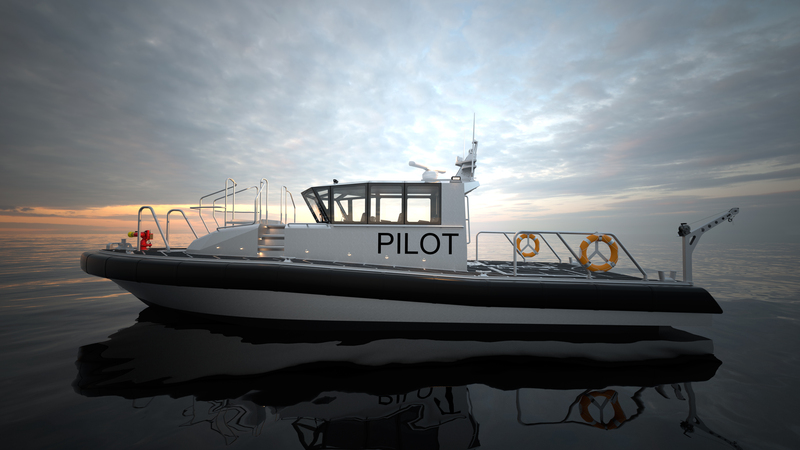 Click to see the 45 Defiant configured for fire rescue or pilot boat use. 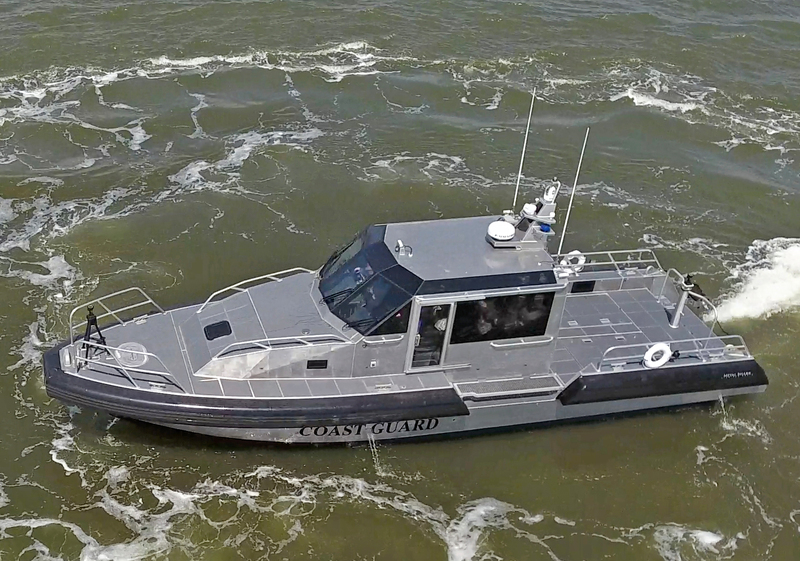 Regardless of configuration or equipment, the 45 Defiant offers outstanding performance and durability combined with industry-leading, crew friendly features. The result is a proven platform that is stable, dependable, highly capable, and well suited for both inland and offshore use. The 45 Defiant features a proven Metal Shark hull design that has been engineered and built to precise tolerances. To achieve its superior hull life rating of 30+ years, the vessel’s hull, deck, and pilothouse structure are composed entirely of heavy, welded plates of premium-grade 5086 aluminum alloy. The hull has been specifically balanced and will steer a straight course and turn predictably and safely without chine hooking or other unnatural turning behaviors. 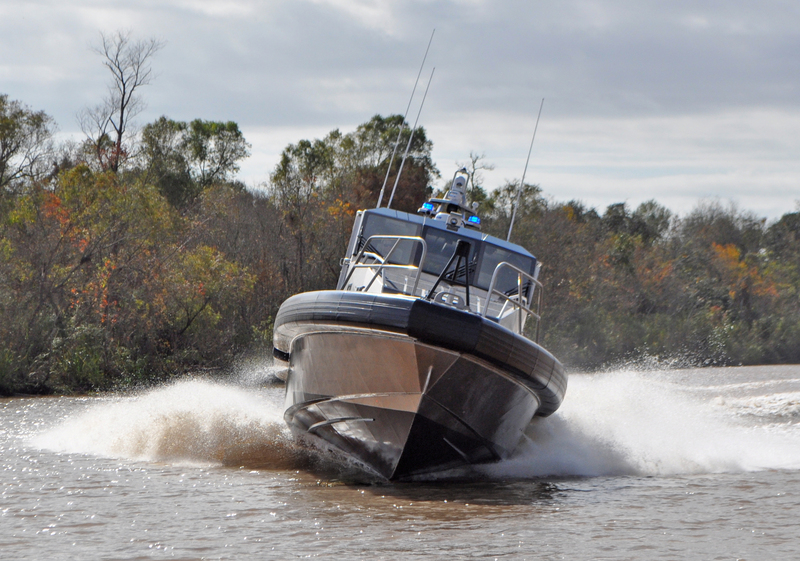 The 45 Defiant may be equipped with straight-shaft inboards, water jets, or pod propulsion systems. At the heart of the 45 Defiant’s crew-friendly design is a spacious deck arrangement offering wide-open work spaces and allowing for easy, surefooted passage from bow to stern. The vessel layout may be custom configured to meet specific mission requirements, but regardless of configuration careful consideration is given to the placement of grab rails and footholds. All belowdecks machinery spaces are easily accessed via large water-tight deck hatches, and walkways feature low-level LED lighting for nighttime operation. A durable urethane- sheathed, closed-cell foam collar provides maximum impact protection. In lieu of the collar, a heavy duty rubber rubrail is also available. 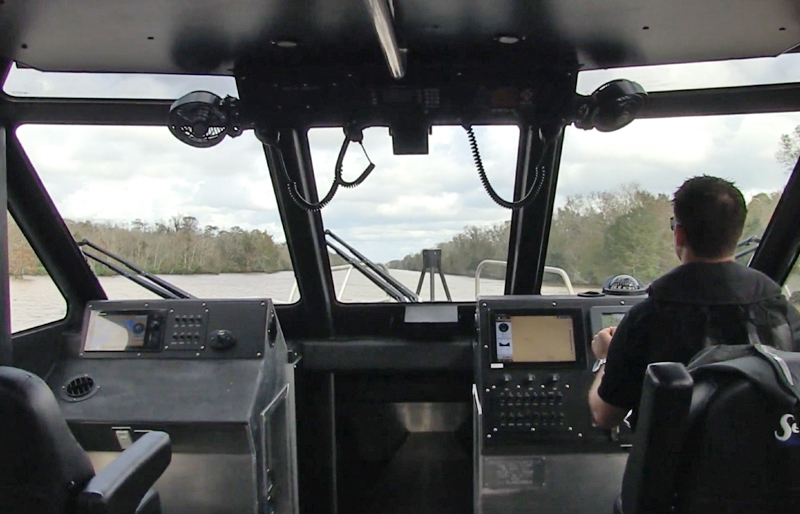 The most immediately apparent advancement in Metal Shark’s Defiant pilothouse design is the use of pillarless glass to substantially enhance visibility. The result is a near elimination of the dangerous blind spots which are an unfortunate drawback of conventional pilothouse vessels. Large spotter windows allow the crew to see overhead aircraft, elevated structures, or taller vessels. Further, the 45 Defiant’s quickly-opening side and aft pilothouse doors offer added flexibility and greatly facilitate crew communication when docking or maneuvering alongside another vessel. The cabin space is fully configurable for any mission profile, with multiple options for crew seating, dining, and lounge areas. 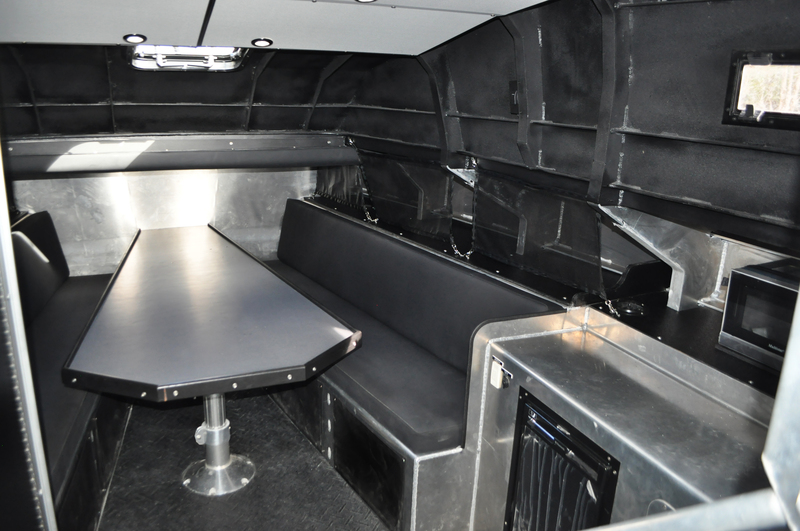 Common options include shock mitigating captain’s chairs, settee and dinette, galley and chart tables/desk areas. The 45 Defiant’s fully customizable below-decks crew accommodations are easily accessed via a large companionway in the pilothouse. The standard layout features an enclosed head on the port side, which includes a marine toilet, wash basin, and hot shower. 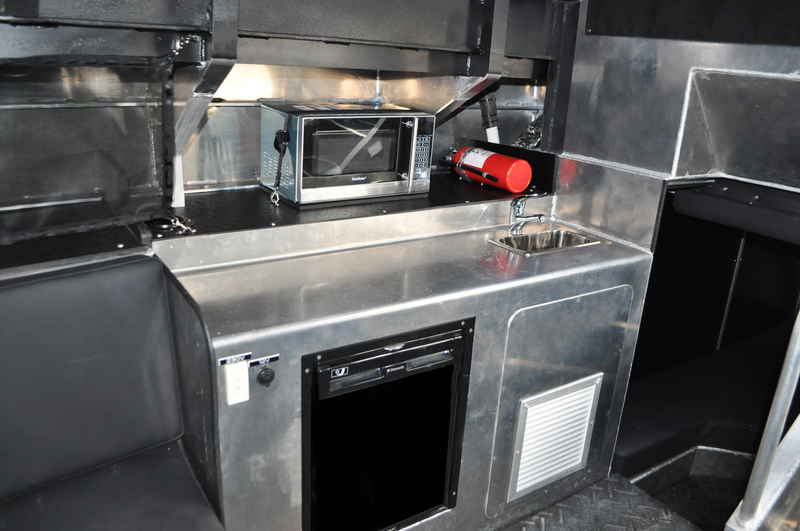 A full galley with sink, microwave, electric cooktop, and refrigerator has been located to starboard. Forward of the head and galley is a crew seating area with table and settee that can double as sleeping berths. A spacious mid-cabin features dual bunks or can be used as storage or multi-use space. The 45 Defiant may be custom configured to suit a wide range of mission profiles. 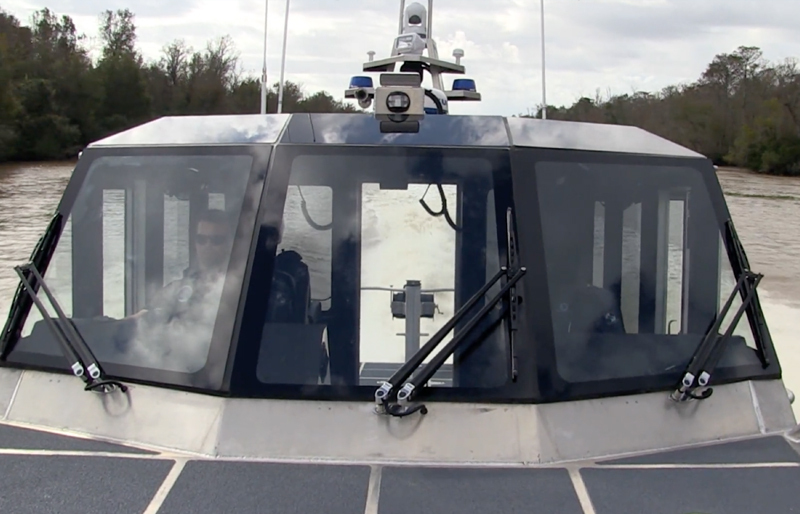 Shown here in pilot layout, the vessel features 360-degree flush decks, forward boarding platform, pilot-specific windshield with large overhead windows, and man-overboard recovery area with Jason’s cradle. 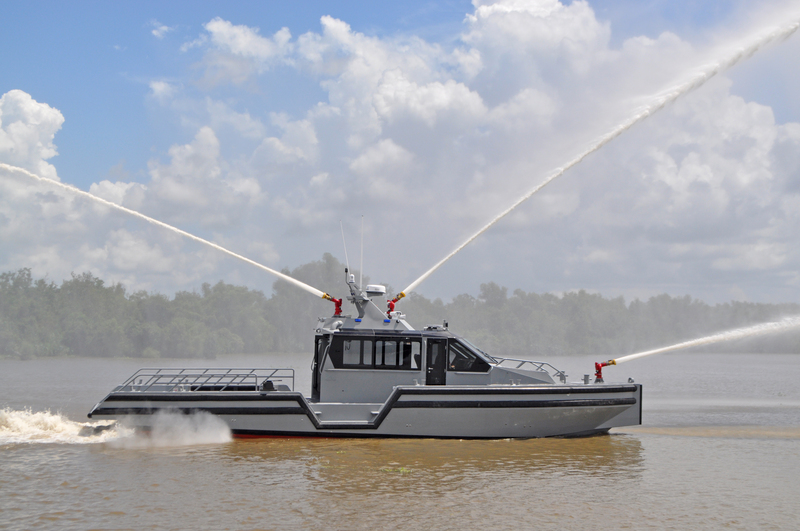 The 55 Defiant Fire Rescue shown here employs the same proven hull design as the 45 Defiant and serves as an example of a 45 Defiant in Fire Rescue configuration. To meet the customer’s fire fighting requirements, Metal Shark employed twin Darley fire pumps driven by PTO from the main engines. Water is pumped to an oversized main where it is distributed via electronic valves to three RF-controlled monitors. In this configuration, the vessel delivers water flow of up to 10,000 gallons per minute. Two 5” hydrant outlet locations, an additional 2.5” hydrant outlet, and a 300-gallon foam reservoir provide maximum flexibility across the widest possible range of firefighting scenarios. 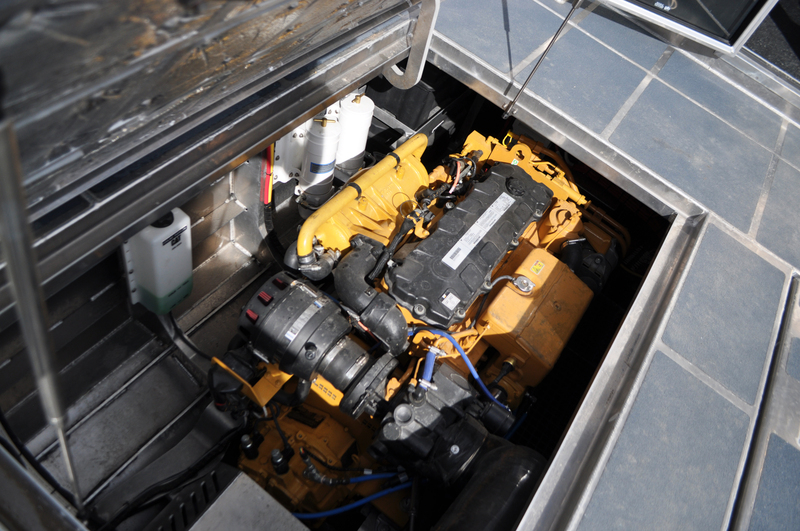 Available power includes twin Cat, Cummins, Volvo, and MTU options. Propulsion can be in the form of conventional shaft drive, waterjet, or pod propulsion systems. While waterjet propulsion offers speed and maneuverability advantages, the conventional straight shaft configuration offers lower acquisition costs, maintenance costs, and is serviceable anywhere in the world with basic tools and training. 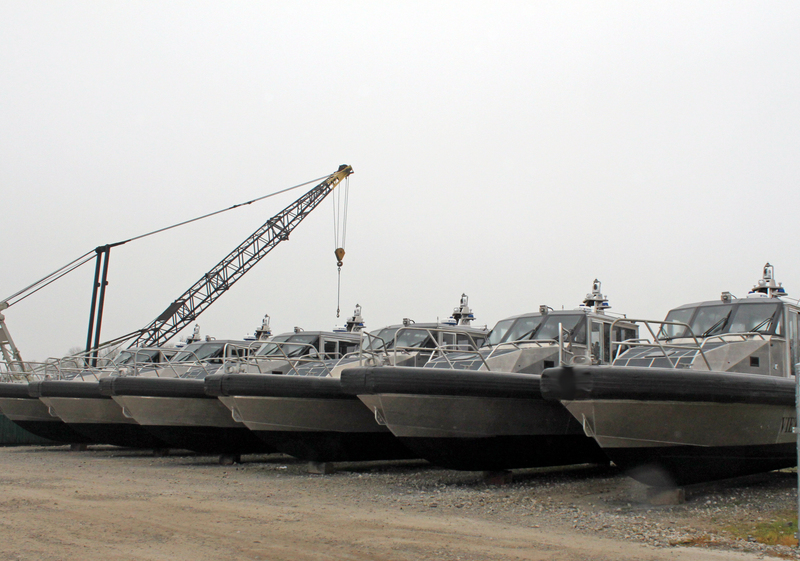 In 2016, Metal Shark delivered the first six 45 Defiant patrol boats of an eighteen-boat order from the US Department of Defense, providing advanced technology to stabilize US interests in South Asia. 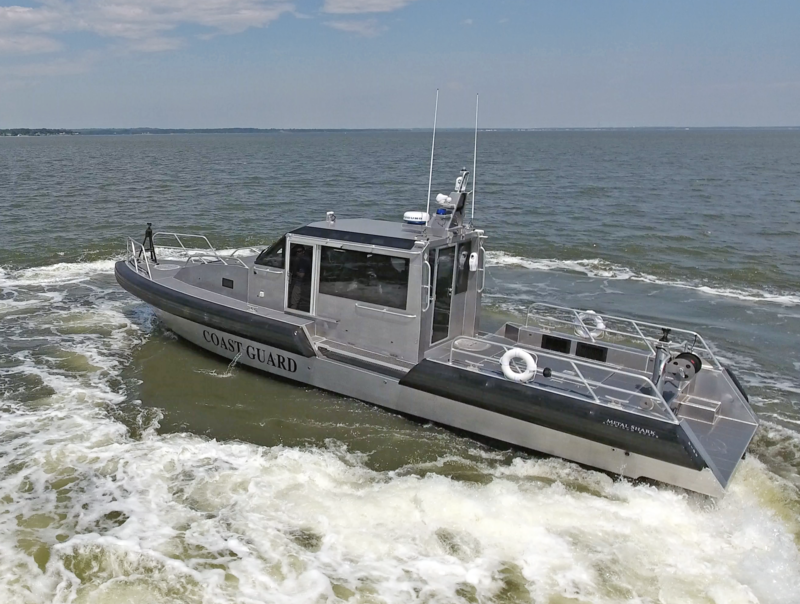 These very nimble and capable military patrol vessels are configured for coastal and nearshore patrol, search and rescue, and interdiction. 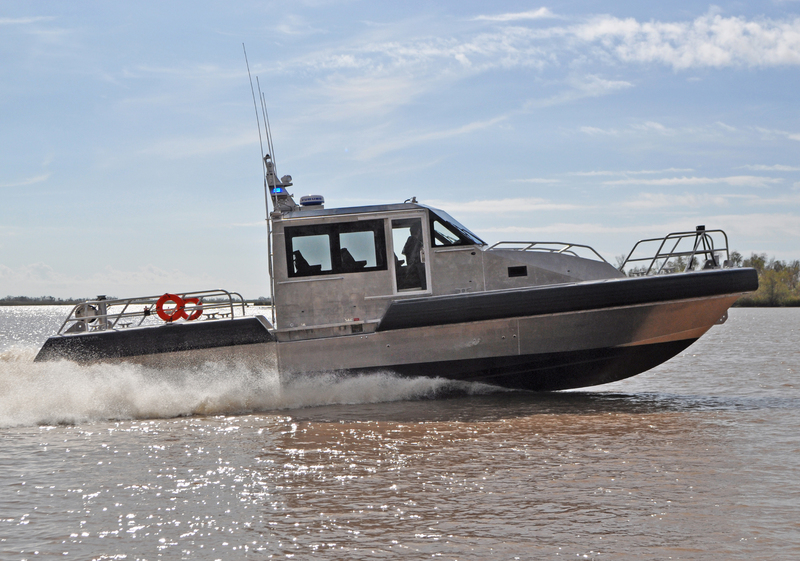 They are powered by twin Cat Diesel C9 engines and Hamilton waterjets. Production is ongoing. For more information about this or any other Metal Shark model, we invite you to contact us today.